The National Center for Arts Research recently ranked the Council Bluffs metro at No. 6 on the list of most vibrant art communities in the country . The list measures artists, cultural organizations, and public art around the country, and notes it's the first time the Omaha-Council Bluffs metropolitan statistical area has received the center's designation. "In Council Bluffs, the biggest arts and culture growth is concentrated in the South Main district," the list report states, attributing much of the center's nod to Pottawattamie Arts, Culture and Entertainment (PACE) , "one of the leading institutions driving the area’s growth." The center says it considers three main characteristics when assessing a community's arts vibrancy: supply, demand, and public support for arts and culture on a per capita basis. "We gauge supply as total arts providers, demand with measures of total nonprofit arts dollars in the community, and public support as state and federal arts funding," the report states. While there's more to the designation than public sculptures, Council Bluffs does have 31 pieces of art around the city. You know, it's fun to be a part of a community that's into the arts and getting more and more recognized and having a community where we can all reach out to each other and it's great to be in a community that's getting some recognition finally. "You know, it's fun to be a part of a community that's into the arts and getting more and more recognized and having a community where we can all reach out to each other and it's great to be in a community that's getting some recognition finally," Collin Kartchner said. One local artist still thinks the area could use more art. "It's interesting," Tres Johnson, owner of Drips art gallery said. "I think there's a lot of cool public art around. I always think there could be more done or more awareness of what's out there." 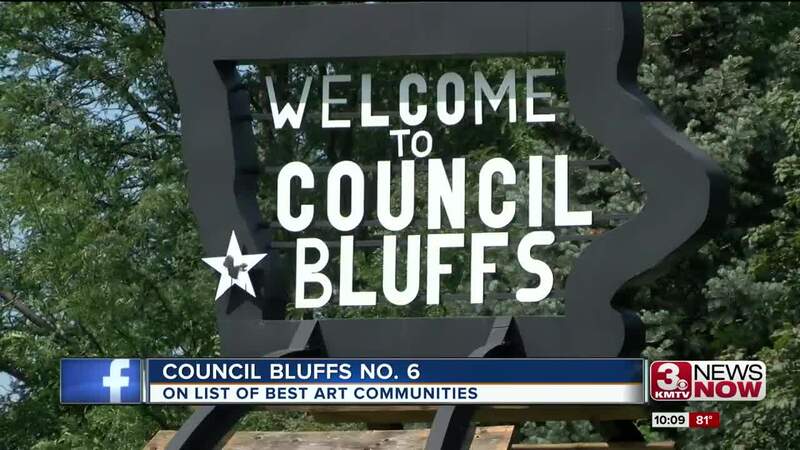 Coucil Bluffs ranking isn't all about visual art, though. On Wednesday night, Bayliss Park crowds gathered to watch a local jazz band Luigic, Inc. play. The band's bassist is from the area and recalls a point in time music was more prevalent in the city. "There used to do this thing called first night," Steve Gomez said. "It was a great event for the community here, a lot of the venues here around the park had something going on so it's something I hope they have a chance to revive." Council Bluffs is home to 31 different works of art.